There's nothing more trivial than trivia, and here is some more trivial trivia about Ohio. For some reason the Bellefontaine area in Logan County seems to have amassed a number of unusual Ohio details. Could there be some mystical Native American connection with the area's colorful past? We can't explain this with an rational explanation, so we'll just present the facts and leave it up to you to decide. Everyone knows that Ohio has no mountains, except in an episode of the 1970s TV show "Project U.F.O" direct by Jack Webb. In the TV series the lead investigators were visiting the famous Wright Patterson AFB in Dayton. In the background were snow-capped mountains! 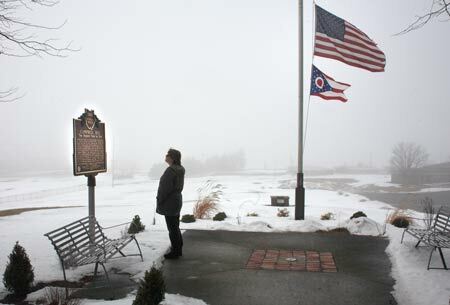 Obviously, Ohio has no snow-capped mountains, but do you know where the highest point in Ohio is located? When you visit this place, it really won't even seem like it's all that high, but with an elevation of 1,549 feet, you can say you've been high in Ohio, if you visit 2280 SR 540, just northeast of downtown Bellefontaine. There's a educational facility located there called Ohio Hi-Point Career Center. The name of the mountain is Campbell Hill. Campbell Hill is named for Charles Campbell of Bellefontaine. He owned the land during the early 1900s. At the turn of the last century, a small marble stone was placed on the spot marking it as the highest point in Ohio with an elevation of 1549.09 feet. From 1951 to 1969 the area and buildings located there were part of the North American Air Defense Command (NORAD). If you're old enough to remember the live Christmas Eve telecasts of Santa Claus' journey annual journey, those telecasts reportedly used tracking data gathered from this NORAD base. I guess it was also going to be used to keep track of Russian missiles should they have ever appeared coming over the horizon. While you're visiting the high point in Ohio, just down the road in Bellefontaine, you can also view a small section of the very first concrete road made in America. Poured over a hundred years ago, the road surrounds the Logan County Courthouse. Bellefontaine has a number of points you can check off your bucket list of things to see: the highest point in Ohio, what's left of the first, and oldest concrete road in America, plus, the shortest street in America. I mean why bother? There is a marker noting that visitors are now standing before the shortest street in America. McKinley Street is just 20' long and the folks that measure the length of streets and roads across America have determined that this little strip of pavement is officially the shortest street in the country. Whether that's true or not, we can't prove it one way or another, but Bellefontaine is laying claim to that title. 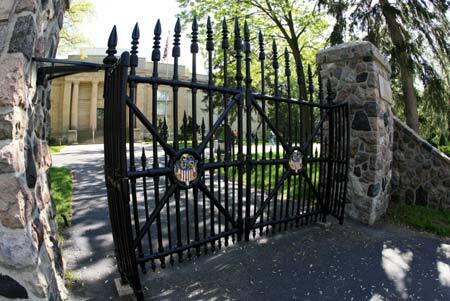 In Fremont Ohio at the former home of the oldest son of Rutherford B. Hayes and that is now the Presidential Library of R. B. Hayes, are the former gates used to protect the White House in Washington DC since the time when Ulysses S. Grant was president until 1921. In 1921 the gates around the White House had to be replaced when automobiles were becoming more popular around the country. The reason the gates had to be replaced is that they were too small. When originally installed, horse & buggies were the norm. With the automobile, those old gates just didn't work, so Hayes son, Col. Webb C. Hayes petitioned then president Warren G. Harding to use the gates at the new library. Harding agreed, but in Washington DC, nothing is ever that simple. Congress had to approve the transfer of ownership which took Col. Hayes 6 years of dealing with Washington red tape before he gained possession. 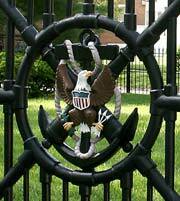 Today those 5 iron White House gates surround the Rutherford B. Hayes Presidential Center. The gate at top is located on the north entrance to Spiegel Grove. The close up at left is the main entrance to the estate and shows the Presidential Eagle, while the other gate depicts the Presidential Shield. Rutherford Hayes was also the first president to use the Presidential Insignia and it was under his direction that this seal was created. It is strikingly different from the Seal of the United States' eagle which had the eagle's head pointed left as seen by the viewer. The Presidential Eagle's head pointed right, and remained this way until President Truman implemented a re-design of the Presidential Eagle by turning the eagle's head to the left as seen by a viewer. What does all the left and right pointing signify? Not much. Tradition called for heraldic eagles to point to the left. Some myths have grown up that because the eagle contained arrows clutched in it's left talons, the big bird was looking towards war, instead of peace signified by the olive branch held in its right talon. More likely it was Hayes' wish to distinguish the White House as being a different segment of the federal government. 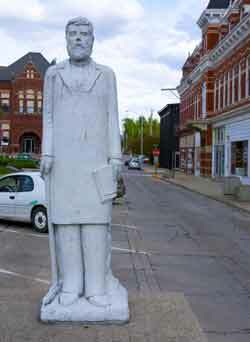 Fremont Ohio was not the original name associated with the town. 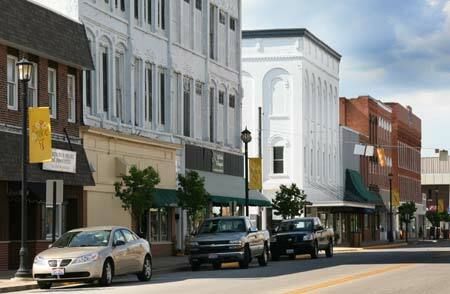 Originally, the community was named Lower Sandusky. Now, Lower Sandusky is actually above, Upper Sandusky, which lies almost due south by about 40 miles. Plain old Sandusky is about 30 miles to the northeast. Plus, Fremont is the county seat of Sandusky County. Very confusing. Rutherford B. Hayes, later, one of the most notable residents of Fremont, along with other Lower Sandusky residents brought about the name change to end the confusion in names. In 1849, Lower Sandusky residents elected to change the village's name to Fremont, in honor of John C. Fremont, who had just captured California for the United States in the Mexican American War. After signing the peace treaty that ended the Mexican American War in California in 1847, John Fremont, who defeated the Mexican forces stationed in Santa Barbara, was appointed as the military governor of the area by Commodore Stockton. 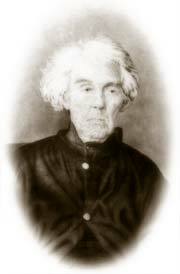 Freemont's superior officer, General Kearny, felt he, General Kearny should have been appointed to the position and arrested and had Fremont convicted for mutiny. President Polk quickly pardoned Fremont, and John Fremont became one of the first senators of California in 1856. According to the 1994 Guinness World Book of Records, there's a bar in the Beer Barrel Saloon in Put-in-Bay on South Bass Island that owns the record for being the longest bar in the world. It is 405' 10" long. There have since been other claims to that title, but at least it is still the longest bar in Ohio. 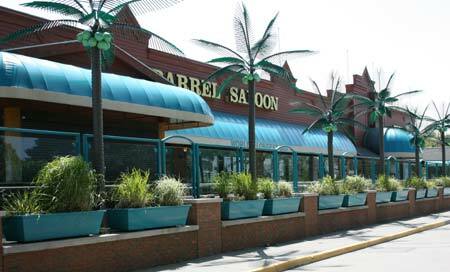 The bar has 160 bar stools, 56 beer taps and employs 20 bartenders on a busy night to keep the drinks flowing. By the way, if you could stand the bar on end, it would be taller than the nearby Perry's Victory Monument. Everyone knows that George Armstrong Custer was the general that led his troops into a disastrous battle against overwhelming odds at the Little Big Horn. Before that he gained fame as a calvary officer during the Civil War. But, did you know before that he was an Ohio school teacher and that he was born in eastern Ohio? Another little known fact is that 2 of his brothers and his brother-in-law also died in the same battle as he did. Today there is a monument honoring the life and feats of George Armstrong Custer in his hometown of New Rumley which was created by his uncle. John Wayne, the famous actor, was not born in Ohio, in fact he was born in Winterset, Iowa with the name Marion Robert Morrison, a name which the young Marion did not like. He did have a dog named Duke, and he liked it when people called him Little Duke. Later in life he took on the name Duke Morrison and used that name in his earliest film Words and Music (1929). In 1930 he was given a chance to star in the film The Big Trail, a western. The director, Raoul Walsh was a big fan of Mad Anthony Wayne, a Revolutionary War general, and a General who successfully led a campaign through western Ohio against a number of Native Americans which ultimately resulted in the Treaty of Greeneville. Director Walsh wanted to give Morrison the name Anthony Wayne, but the head of Fox Studios thought it was "too Italian" sounding and suggested instead John Wayne. That stage name stuck and the rest became legend. 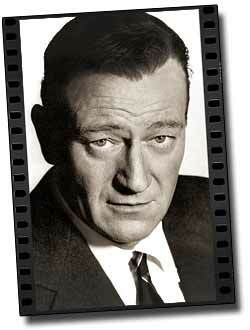 John Wayne never used his stage name in private-- to his friends he was always just Duke. According to tradition, Ohio son and 18th President of the United States, U.S.Grant, was the first president to receive a speeding ticket while holding the office of President of the United States. Grant was driving a horse-drawn carriage through the streets of Washington D.C. when the event allegedly occurred. Who knew they had speeding laws at that time? Now, according to the Ohio History Central, the first paper automobile speeding ticket was issued in 1904 to Harry Myers who was driving on West Third Street in downtown Dayton. Harry was "clocked" by a local constable at the outrageous speed of 12 mph. There was no evidence cited whether Harry appealed the written ticket, or just paid the fine. Tucked away in the wonderful community of Ashville, is the world's oldest traffic light still in working order, even though it's now inside Ohio's Small Town Museum. According to the museum, the light was retired from active duty in 1982 only because color-blind people couldn't tell if it was green or red. The space age looking traffic light has never stopped working since 1932 when it was installed at the corner of Main and Long Streets in Ashville. The museum is located at 34 Long St., Ashville, Ohio and open Monday - Friday 8a.m. - 3 p.m. and Saturday from 9 - 12. 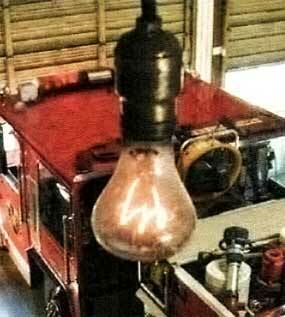 Located in Livermore, California inside Fire Station #6 is a very old light bulb (shown at left) that is still working. Nicknamed the "Centennial Light" since it has been working since 1901. The bulb has been featured on numerous television shows, Guinness Book of World Records, Ripley's Believe-it-or-Not, it even has its own web cam. But you might be wondering what is the Centennial Light's trivial connection to Ohio? The famous Centennial Light was actually manufactured in Ohio by the Shelby Electric Company which first began selling their filament light bulbs in 1897. In 1912 General Electric purchased the company and in 1915 moved the manufacturing plant out of state. Shelby is located northwest of Mansfield. What made the Shelby light bulb (another bulb similar to the Centennial Bulb shown at left) so special that it could last 100+ years? After some scientific investigation they found that the Shelby light bulb filament is .08 mm which is about the same size as a human hair, compared to other light bulb filaments that are just .01mm thick. The other differences belong to the bulb's designer: Adolphe Chaillet, of Paris, France. When it became known to Mr. Chaillet that the Shelby Electric Company was preparing to manufacture incandescent lights, he came to America to try and convince the company to use his patented process instead of either Mr. Edison's or Westinghouse, the two main incandescent manufacturers in the country. Shelby Electric decided to go with Chaillet's design. The patent specified a slightly different bulb shape that was designed to provide maximum illumination in the downward direction (assuming it was suspended from a ceiling fixture. Mr. Chaillet's filament design, other than its size, uses a square configuration of almost pure carbon, compared to a round cellulose/carbon filament. The manufacturing steps were more complex that Shelby's competitors. 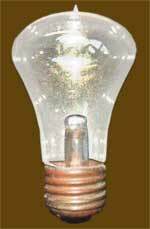 Even though the bulb was superior, they could not meet national demand. Construction on this monstrous contraption began in 1967 and went on line in 1969. It stood as tall as a 5 story building. It was taken off line in 1991. 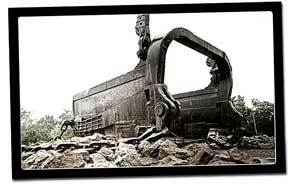 During its 22 years of service, this piece of equipment moved almost 5 million cubic yards of dirt. Now all that is left of it is the big bucket, which has become a tourist attraction in Morgan County where people like to have their photograph taken standing inside. Its name was Big Muskie because it worked along the Muskingum River in eastern Ohio. Ohio has always been proud of the firsts its people have brought to the nation, from the Wright Brothers and Thomas Edison to Neil Armstrong, our State leads the way. In Noble County, however, there is a man known for being the last. 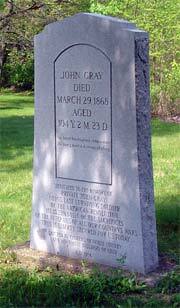 He was John Gray, Americas last Revolutionary War Veteran. John Gray was born in Virginia January 6th 1754 on a small farm next to George Washington's Mount Vernon. He was the oldest child in the family and when it was time to work outside the family farm he found work at Mt. Vernon. Mr. Gray remembered fondly his time spent on the plantation and recalled how on several occasions Mr. Washington stopped, shook his hand and spoke encouraging words to him. When the war started John Gray's father took up arms and was killed at the battle White Plains. John Gray took his place and fought on through the war. He was present at the surrender of Cornwallis at Yorktown. After the war he married and moved to the Ohio Country. This is where he raised his family and lived until his death March 29 1868 at the age of 104. Today a monument has been erected along SR 821 just south of Belle Valley. It is in a small roadside park the kind you would have seen along any highway in Ohio during the 1950's. The actual grave site is not far away located on Brookfield Twp Road near Hiramsburg. John Gray yet another Ohioan you should know.